I am proud to say that I have been a BEE most of my life. I grew up in Bridgman with my parents, Mike and Pam, and my older sister Kelly. I attended Bridgman Public Schools and I loved every second it. After high school, I attended Spring Arbor University where I met my wife Kelly. She is currently a Kindergarten teacher at Bridgman Elementary. We have two children; Tinley and Colton. Competitive sports have always been my passion in life. I have competed in high school and college athletics. I enjoyed playing basketball, baseball, and golf at Bridgman High School. I was a first team all-state pitcher and an honorable mention all-state point guard. I was also named the Berrien County Athlete of the Year. I excelled well enough to earn a college scholarship to attend Spring Arbor University where I played basketball and baseball. After one year of basketball I decided to put all of my concentration on baseball. During my senior campaign I earned NAIA First Team All-American honors as a pitcher. After college I was offered a professional contract to play baseball with the Frontier League. I decided to hang up my cleats and become a teacher/coach. I started working at Bridgman Elementary School, teaching 4th grade, in 2004. In 2008, I transferred to the Reed Middle School to be the male physical education teacher. Just this year I started teaching Elementary PE. I also coach the Bridgman boys Varsity baseball team and the Junior Varsity basketball team. 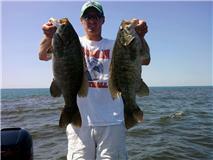 During the summer I participate in competitive bass fishing tournaments. I was taught that winning is important, but so is losing. I've learned not to let a temporary setback, like losing, become a permanent failure. Overcoming temporary setbacks will build character; the type of character that creates successful citizens. Ultimately, my goal is to build character and give my students/athletes the skills necessary to succeed at life. Oh, did I mention that I love catching smallmouth bass!! !